Bula and welcome to USP. I am Elisha a recent addition to the International team where I started as the Project Coordinator- JENESYS 2016 and now the Short Courses Coordinating Officer (SCCO). I hail from the Jet-Set town of Nadi and have been living in Suva for over a decade now. I have graduated from USP with my BA in Psychology and Theatre Arts and a Post Graduate Diploma in Psychology. 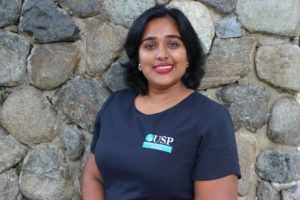 I have worked with the School of Social Science (FALE, USP) as a tutor and marker for Psychology and as the Campus Life Officer (coordinating USP’s orientation week). Recently, I have completed my Post Graduate Diploma in Pacific Studies as well and look forward to graduating this year (2017). My profound interests and passion lie in cross-cultural, youth and creative arts, thus, enjoying my work with the International Office. I am actively involved with various youth groups and Non-government organization on a volunteer basis and work with communities and groups on human rights, leadership, equality and climate change. I enjoy DIY/craft projects, watching movies, food, travelling, learning about diverse cultures and photography. Additionally, I enjoy learning the history behind monumental places in different countries. My version of a great day would include the sun, good food, music and a cup of tea with people I can learn from, share with and create memories. I wish you the best of luck studying at our beautiful, friendly and fulfilled campus and I hope to hear about your side of the world too.